Posted on April 28, 2014 by Rachel aka "Sweet Pea"
I want to rename this “The Most Popular Cake You Will Ever Make”, but that’s pretty long and it’s not going to help you find the recipe again. I’m pretty sure it really is the most popular cake you will ever make. Even better than that it’s easy and you will really, really, really like it, a lot. It get’s better than that. It freezes beautifully for up to 6 months. No, this is not a knife infomercial. Yes, you should make this cake as is and then make it again with whatever substitutions you think you should make. May I present, for your eating pleasure (I guess if you don’t make it, it’s only for your viewing pleasure. That would be a shame. 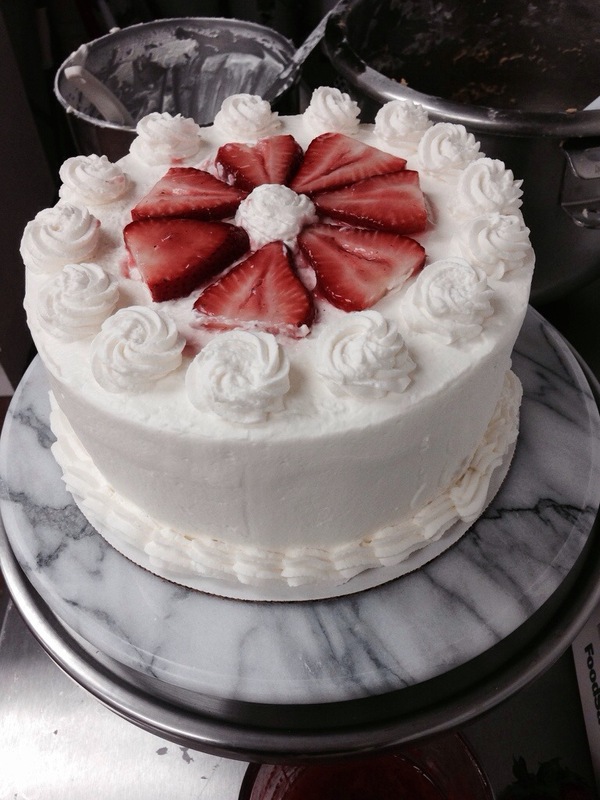 ), the Strawberry Chantilly Cake. I have to admit, this cake makes me want to wear frilly aprons, sing, dance, wear pearls and high heels in the kitchen and generally puts me in a very good mood. Everything about it is sheer pleasure to me. I could look at this cake for days before eating it. I could eat this cake for days and still be thinking about it when it’s gone. I’m kind of crazy like that when it comes to food, but honestly I was born that way. Just read my baby book. If you could, you would see it says, “8 mos. Loves cake and bread”. I’m just celebrating who I am by enjoying the way food looks and smells, how it tastes, the texture and variety and complexity of it all. If you pay attention at all to food you’ll surely have to admit to the existence of the Creator, but that’s an entirely different subject. Back to cake. The thickened strawberry puree is just 1/2 pound fresh strawberries – mashed, 2 Tbsp. cold water, 2 Tbps. sugar and 1 Tbsp. cornstarch. Mix it all together in a medium saucepan. Stir over medium heat until it has bubbled and the juice is clear and thick. Set it aside to cool. You will need 1/2 cup of this cooled puree. The Chantilly cream is possibly the best part of the cake and the part of this recipe you will use over and over again with many other cakes, cookies, etc. Once you taste this frosting you may have difficulty making any other frosting for a while. The ingredient list is pretty short and it will most likely be one of the easiest frostings you can make. 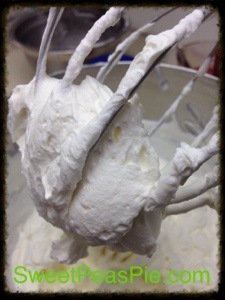 Technique is everything when it comes to whipping cream, so pay attention to the details! Butter is not what we are going for here. Chill your bowl and add to it one pint of heavy whipping cream (2 cups). Here’s the important part. Mix on medium low speed. It will take longer, but it will build smaller bubbles and smaller = stable = not runny in an hour! This is the French way and it works like a charm. That cream is expensive. You have yourself to impress. Tell yourself, “you’re welcome” and slow down. 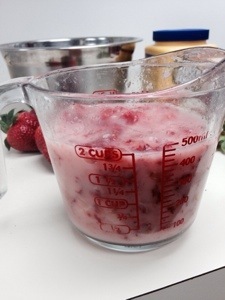 While your cream is slowly beating, mix together 8 ounces of room temperature cream cheese, 1/2 cup granulated sugar and 1 tsp vanilla extract (I use 1 Tbps when I make it) until combined. 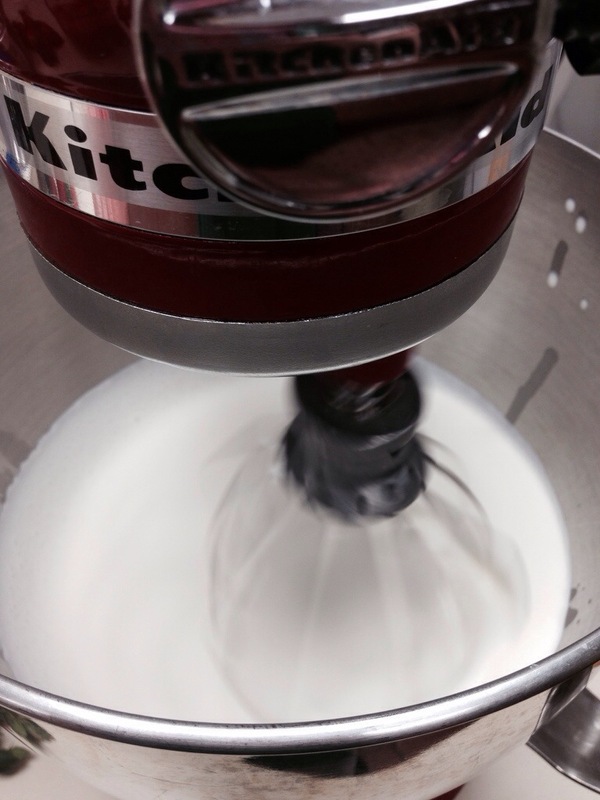 Once your cream has reached a soft peak stage or starts to thicken, slowly add in your cream cheese mixture. Keep the mixer running on low speed as you do this. Stop to scrape the sides and the bottom of the bowl once or twice as you go. When you are done it will be quite stiff and thoroughly combined. Do not continue whipping once it is thick and combined! 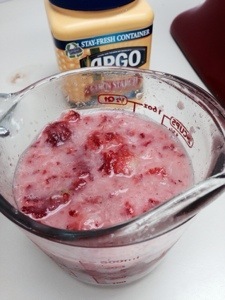 Take 1/2 cup of this mixture and gently fold in the thickened, cooled puree and set it in the fridge. This will be the middle layer of your cake. Put the rest of the Chantilly cream into the refrigerator until you are ready to decorate your cake. If it will be in there for more than an hour or two, be sure to cover it tightly. The cake came from allrecipes.com. If you want to play with the serving sizes, etc. 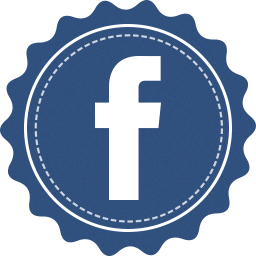 you can go to the original recipe and the website allows you to change quantities and it will recalculate the recipe for you. 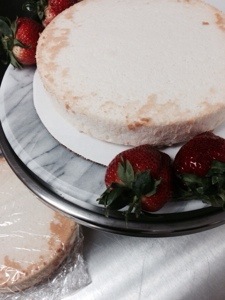 It’s the perfect blend of white cake and angel food cake and it comes together really quickly. This cake hints at strawberry shortcake, but in a lighter, more refined way. I’ve used 1/2 recipe for two 9 inch rounds. 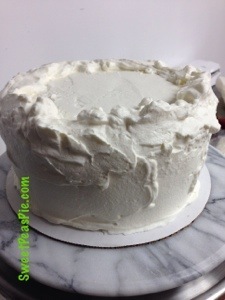 The whipped cream frosting is also from allrecipes.com and you will really love the taste and texture of it as will your guests. Once you’ve made the three components you’re ready to assemble the cake. 1. 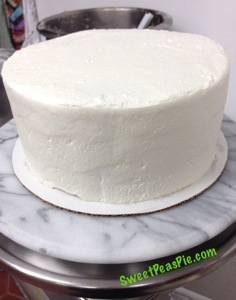 Put your bottom layer, top down, on your cake plate or board. 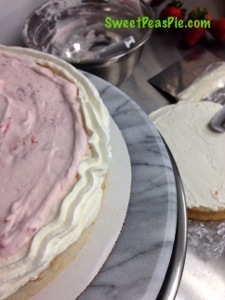 Then put a thin coat of Chantilly Cream on the “inside layers” of both the top and bottom cake layers. 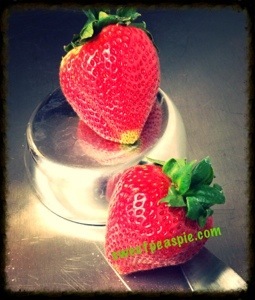 This will seal the cake and protect it from soaking in any of the Strawberry Chantilly Cream. 2. Fit your pastry bag with your favorite tip, I like a larger round tip or an open star tip. 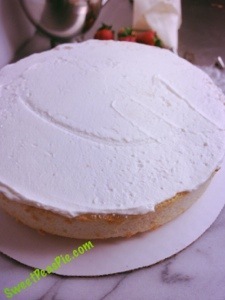 Load your pastry bag with Chantilly Cream around the diameter of your bottom cake layer. It should create wide enough boarder to hold in your strawberry filling. 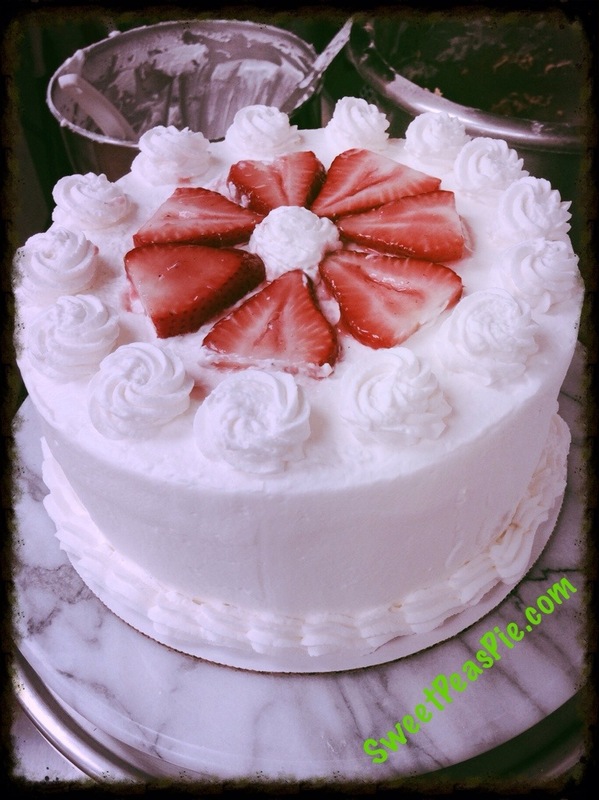 Gently fill the center of the cake with Strawberry Chantilly Cream. 3. 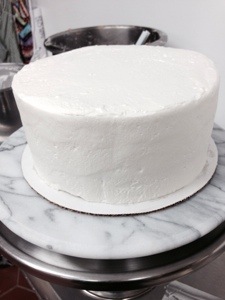 Place your second layer, Chantilly Cream side down, on top of the bottom cake. It should rest nicely on that border you piped earlier. I have found that I do not need a crumb coat with this cake, but if you are more comfortable decorating that way, go ahead and crumb coat and refrigerate your cake at this point. 4. The key to getting a smooth and even frosting layer on your cake is to use more frosting that you need. Can you see how I have really built up the frosting at the top? You can get the most even top this way. Also, make sure you have enough frosting around the bottom edge. Once you have thick layers of frosting all around your cake, take a bench scraper or similar tool and scrape off enough excess to make it nice and smooth. 5. Use your piping bag to add any final finishing touches you desire. 6. Refrigerate your cake until about 20 minutes prior to serving and again after you are done serving. The cake holds beautifully for up to a week. I prefer to cut the cake with a serrated knife. 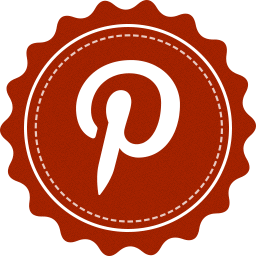 This entry was posted in Dessert and tagged chantilly cream, perfect frosting, stable whipped cream frosting, strawberry shortcake, wedding cake, whipped cream frosting, white cake. Bookmark the permalink.